Aldi has become a major player on the supermarket scene in the UK over recent years, so much so that there have been two new Aldi stores built in our town over the last year. Aldi typically has the reputation of being a budget supermarket filled with budget brands. However, recently Aldi has introduced new lines including affordable organic food and ‘Specially selected’ products. Aldi's new organic range features Broccoli, Onions, Carrots, Cauliflower and Potatoes. The new organic range is very affordable, in fact, shoppers may find that products are 25% cheaper than in other supermarkets. I was able to find lots of organic products in my local store and the vegetables were all reasonably priced and visibly cheaper than other supermarkets. 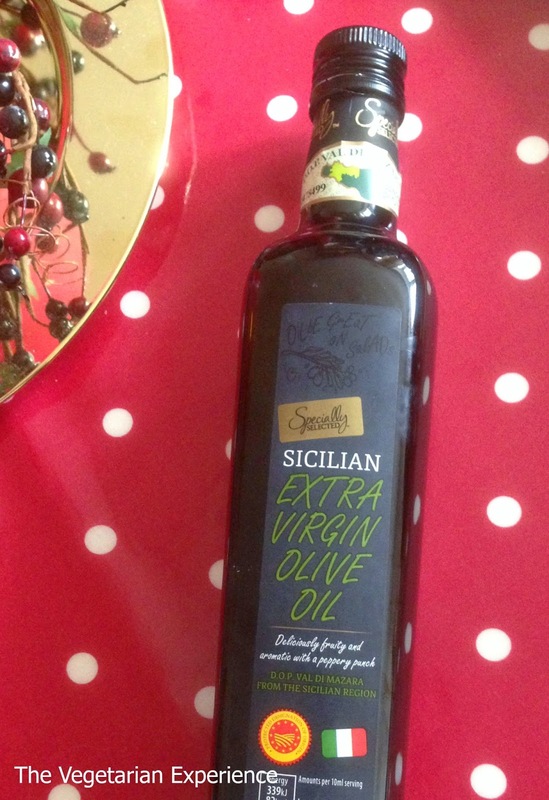 "Specially Selected" products are chosen for their outstanding quality, ingredients, provenance and recipe. In the local store I found the premium brands in curry sauces, fajita sauce, , pasta and pasta sauce, chutneys, beetroot, oil, cheeses, and lots more. I was really impressed with such a wide range of products and interesting and varied ingredients. Aldi challenged me to create some Vegetarian recipes using their new Organic and "Specially Selected" range to see what I thought of the premium ranges. Voucher in hand, I had a good look around the store at the ranges before deciding what to make. 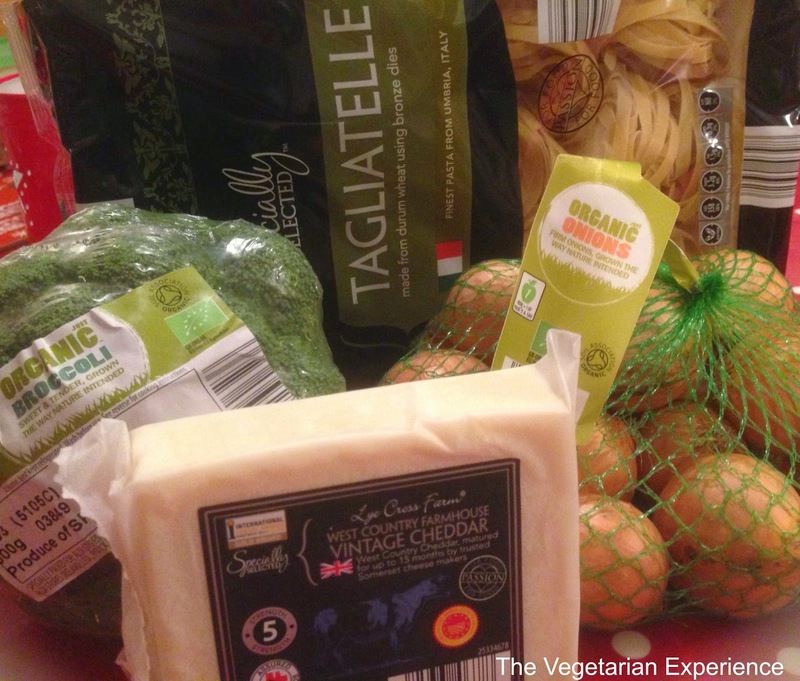 I was surprised to find that there was a such a big premium range, with lots of Vegetarian products in. Plus, they have a fantastic Christmas range in at the moment, with lots of delicious cheeses too. I am featuring a main course here made with Organic and Specially Selected ingredients, and will also feature a dessert in a separate post. With the Organic and Specially Selected range I chose to make Broccoli, Onion and Red Pepper Tagliatelle served with Sicilian Olive Oil and Farmhouse Vintage Cheddar. I used the Broccoli and Onion from the Organic Range. I also chose the Sicilian Extra Virgin Olive Oil and some soft cream cheese to create a sauce, along with Farmhouse Vintage Cheddar. I am really impressed with the new Aldi Organic and Specially Selected ranges. There are lots of fantastic products to choose from and all at very reasonable prices. I shall certainly be visiting Aldi again to purchase from their premium ranges. 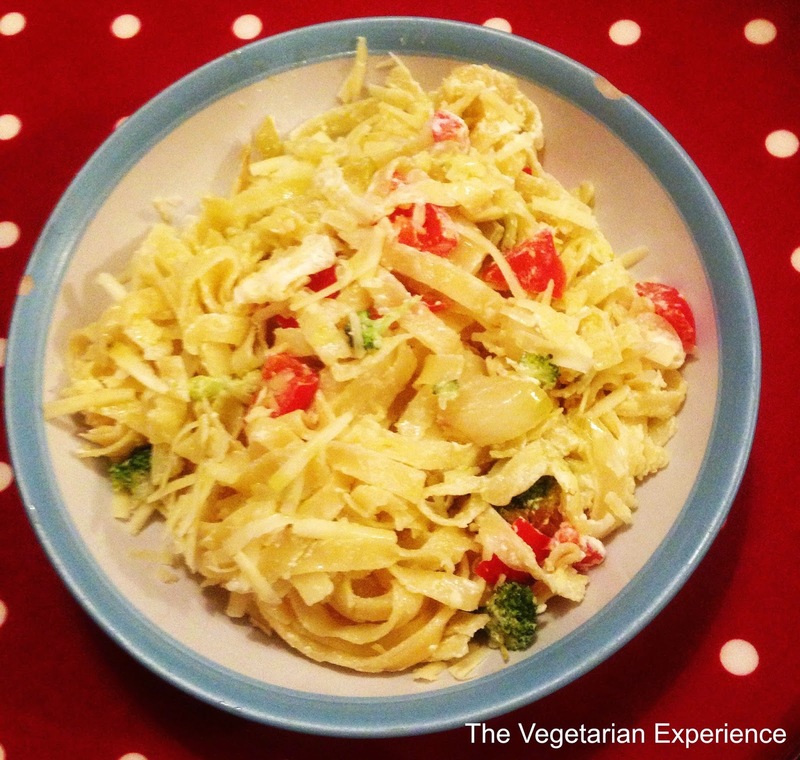 The recipe for Tagliatelle with Broccoli, Red Pepper and Onion served with Olive Oil and Vintage Cheddar can be found below. Do let me know what you think!! Bring a pan of water with a splash of oil in to the boil and then cook the Tagliatelle for around 8-10 minutes. Drain once cooked and toss to separate. Steam the broccoli with four tablespoons of water in the microwave for around five minutes or until "al dente". Heat the oil in a pan and add the garlic and onion, and a little rock salt to prevent the onion from burning. Cook for a couple of minutes and then add the red pepper also. Continue to cook until the onion is golden. Once the broccoli has finished cooking in the microwave, drain the water and add to the onion and pepper. Cook for a couple more minutes until all of the vegetables are soft. Stir the soft cheese and half of the vintage cheddar into the tagliatelle pasta and toss to combine. Add a good glug of the olive oil and toss once more. Add the vegetables to the pan and combine. Serve immediately, sprinkling the reserved cheddar over the top to serve and adding more olive oil if required. You could also add some vegetarian hard cheese over the top if you wanted, or leave out the soft cheese and just add the olive oil and vintage cheddar or hard cheese to the dish. A decent recipe for an delightful evening serving pasta.